The agenda held on Friday, 13 July 2018 in Tazkia University of Islamic Economics College, Sentul City, Bogor. The agenda begin at 1.30 pm in meeting room. The room full off audience from academic and practitioners of Islamic economic. Mr. Nurizal opens the agenda then Mr. Syafi’I Antonio gives the introduction about Prof. Jamil who was lecturing him in IIUM over 20 years ago. Prof Jamil is director in Institution of International Islamic Thought (IIIT) and also dean in International Islamic University of Malaysia (IIUM). Prof Jamil known as a pioneer who integrating Islamic and conventional knowledge in Malaysia, specifically economics. During the seminar session, he delivered issues of Islamization in economics for education institution and also it challenges. He said the current issue facing higher educational institution in muslim countries is balancing and integrating the Islamic and conventional knowledge. International Islamic University of Malaysia (IIUM) designed to become a solution for this issue and claimed as the pure Islamic university since 1983. 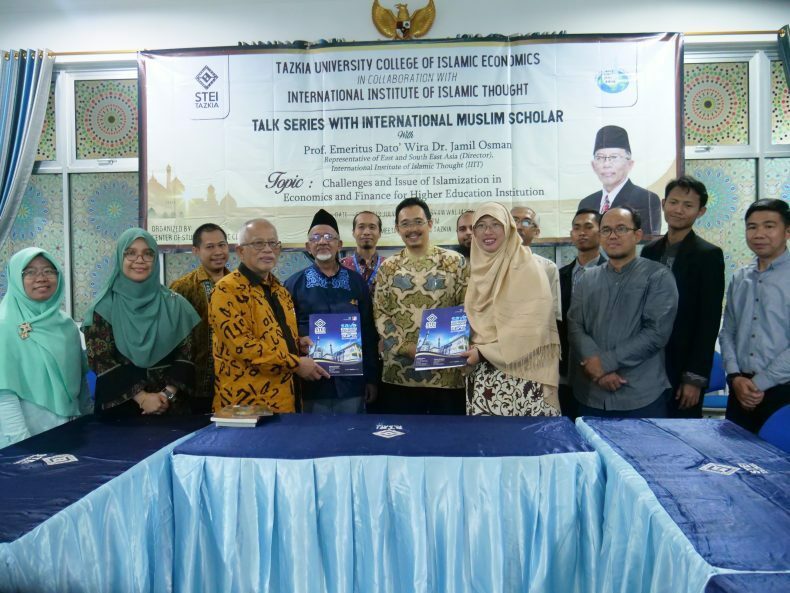 While Indonesia have Islamic university is Indonesia Islamic University (UII) which integrated the Islamic knowledge. He believed the greatest modul of Islamic education if the Islamic knowledge apply in economics and other subject. He found the background education giving impact to basic ability for the students. Students who comes from conventional school has strong ability in math and weak ability in Islamic knowledge. In the contrary, who comes from madrasah has weak ability in math but has strong ability in Islamic knowledge. Then, the religious school will remove math and science because there is no integration with the religion. From this, the transformation was build by integrating subject with Islam. And also by islamizing the knowledge and human beings. But the problem is the student’s capability in language, Islamic and conventional knowledge. So the solution for problem mention is matriculation to unite all perception, and Tazkia has done this programme too. The next programme, IIUM will publish the teaching material. So, the information can be transferred even the professor leave the institution. Dr. Murniati Mukhlisin, M.Acc ( Rector of STEI Tazkia) chair the Q and A session. There are three questions from Mr. Rusydi, Mr. Nashr and Mr. Ali Sakti. The first question is ‘How to eliminate conventional subject to get all Islamic subject?’ And Prof. Jamil answers that some knowledge from Allah and some knowledge from man. We have not to eliminate, but we can modifie it. The second question is ‘Is IIUM still can be best place for Islamic education wether for bachelor, magister and doctoral?’ And he answer that IIUM still lead Islamic University in the world. IIUM still university for ummah. And the last question is, ‘Is IIUM can provide the need of industry?. And he answer yes they do it. © 2019 LPPM STEI TAZKIA. Built using WordPress and OnePage Express Theme.